The San Juan card game is the little brother of Puerto Rico, one of the most popular board games of the past couple of years. San Juan is the capital city of Puerto Rico, and players compete to build the most buildings in the city. 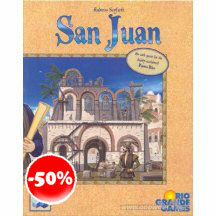 Being a card game, San Juan is a gentler version of the original. A lot of the game play is preserved, but in a friendlier version. And of course a card game will have a more random element than a board game. However, San Juan does a great job of capturing the essence of Puerto Rico play. 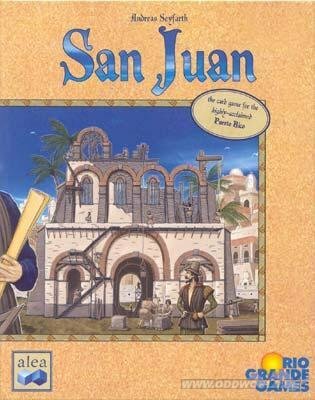 When you don't have enough players or time for a full game of P.R., the San Juan card game will be a welcome addition to your game collection.